But before you despair, please, hear us out first! The reason for the delay, and the reason we are so excited about this new partnership in the first place, is all the cool stuff it will allow us to add to the game (content that all Backers will get absolutely FREE): Added Japanese (yes!) and French voiceovers (in addition to English), FREE for all backers! Extra subtitle languages (Spanish! French! Italian! German! Russian! Polish! Brazilian Portuguese!) FREE for all backers! 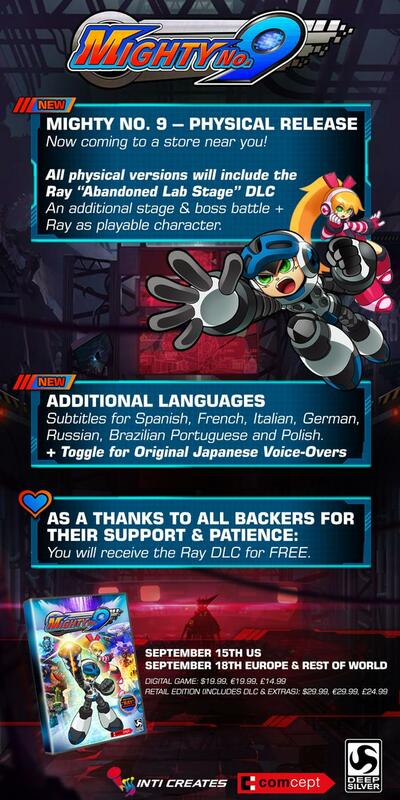 And best of all: the entire Ray DLC set -- an entire extra level and boss (and playable character) -- FREE for ALL backers! And that’s just the big bullet points -- this deal also allows us more time and resources for testing, polish, and the creation of physical retail versions (on some systems), and -- very importantly -- won’t affect absolutely any of our Kickstarter plans or rewards. In short, it will make for an even Mightier No. 9, for backers, for us, and for all our fans, worldwide! We know this is a lot to take in all at once, and we know anytime a Kickstarter ends up with an outside partner some people will be skeptical, so we’ve prepared a short FAQ that goes into a bit more detail about the hows and whys. See if it answers any questions or concerns you have, and if it doesn’t, let us know! It's important to note only some systems will receive a physical version. The PS4 has been confirmed; PS3 and Vita will be digital only. Massive news, not only for Inti and Comcept but for the backers and gamers in general. As a backers and someone that support this game, this made my day. I was looking forward to finally playing a brand-new release day one and blind with the rest of the world over the summer. I haven't played a new release on launch in a LONG time due to lack of funds, and it looks like I'll have to wait until school starts again. Back to the VC for me, I guess. I want to note that it says in the press release that Comcept is keeping a hold of the IP rights to Mighty No. 9 in this arrangement, so that's good. That was the primary thing I was worried about - when you go to a publisher, typically you do not. Pre-Order is up on Gamestop's website and there is a free poster with pre-order. Called my local store and they don't have posters yet, and can't reserve the game in-store yet. They said they should be able to do pre-orders in store tomorrow, and posters will be between tomorrow and a week. Finally, this is what I've been waiting for since 2013. And the best part, it's a physical release and even bbetter, it's only 20 bones. My body is o so totally ready!!!! So... Inafune couldn't do it on his own after all, eh? Despite the overwhelming response, despite the money, despite all the time put into making the game. Interesting... and somewhat humorous. Also, who the heck is Ray? That Zero-Bass.EXE knock-off? I guess that's cool... More content is always appreciated. Though at this point, I think DLC is all this game has going for it. DLC and references/cameos. This is one of the only times I can ever recall a character making cameos in before he's even had a starring role. Well, there's Roy from Super Smash Bros. Melee. I'm actually burned out from MN9 due to the whole Dina disaster. On top of the second crowdfunding for voice overs and DLC (lol), I'm a bit disappointed with how the game is turning out. Oh please drop the sass already. Retail these days is not easy. Poor sales can absolutely ruin a game and the future of it. It's an expensive endeavor, and the Kickstarter was to cover the costs of developing it. This is going to have Japanese voices too?? I can't wait to hear that! I wasn't too much of a fan of the English cast.